Million Dollar Views! 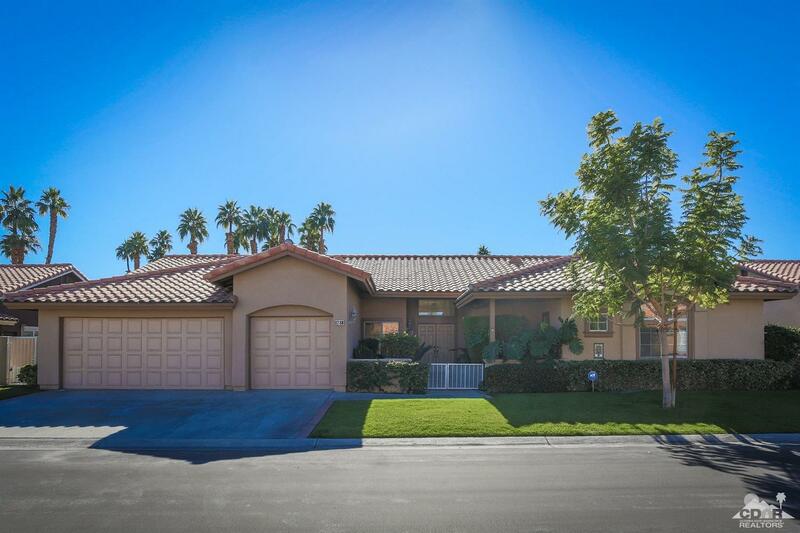 Lovely 2598sf single family home located in the small Gated community of Park Mirage. 20 minutes to Palm Springs Airport, and centrally located to the Desert's fabulous Shopping & Dining. 4Bd/4Ba with Open Floor Plan, loads of windows & High Ceilings on a Premium Lot. The South facing back yard and covered patio offers unobstructed views of the Santa Rosa Mountains. Sparkling Pool & Spa with cascading Waterfall & Fountain. Gorgeous, wide community Greenbelt behind the home, so nothing interferes with the captivating view. Sunny Kitchen with Island, breakfast bar & breakfast nook open to the Great Room. Formal Dining Rm & Living Rm with raised Fireplace. Master Suite with French Doors to pool, spacious Bath & walk-in closet. 3 Guest Bdrms & 3 additional Baths. NEW Carpeting throughout, and Freshly Painted Interior. Indoor Laundry room & 3 car Garage. HOA fee covers: front yard maintenance, basic cable TV, maintains access gate, roads and huge community Greenbelt.